There were standout performances across the board in the Bundesliga at the weekend, with eight clubs represented in the Matchday 29 Team of the Week. It's not easy keeping out the likes of Kingsley Coman, Thomas Müller and Arturo Vidal, but superb goalkeeping from Leverkusen's number one secured Die Werkself a hard-earned point against Bayern, the league leaders' first goalless draw since February 2016. His goal-line clearance in the first half alone would have justified a spot in the Team of the Week, but following team-mate Tin Jedvaj's red card, the Turkish international marshalled Leverkusen's defence to ensure Bayern were shut out for a third time in a row at the BayArena. The Dortmund defender grabbed headlines with his unexpected thunderbolt into the top corner against Eintracht Frankfurt - his first non-headed goal in the Bundesliga for four years - and was once again an imposing presence at centre-back to help secure a 3-1 win. Martin Hinteregger calmly netted Augsburg's opening goal against Cologne to pave the way for three much-needed points in a 2-1 victory. He was also tasked with keeping the Bundesliga's third-top scorer Anthony Modeste in check, a job he performed with aplomb. Watch: Sokratis dedicates his stunning strike to injured team-mate Marc Barta. Replacing Daniel Didavi at half-time, Malli quickly made an impact with an energetic display in attacking midfield. He crowned his display with his first goal for the Wolves en route to a 3-0 victory over Ingolstadt. Scoring his eighth goal of the season, Keita's superb strike was one of four goals for Leipzig against Freiburg on Saturday. The Bundesliga debutants have consequently guaranteed themselves a top four finish this season and a place in Europe. Covering more ground than any of his team-mates, Demirbay's pace and dribbling ability were pivotal in Hoffenheim's 5-3 thriller against Gladbach, while he also scored two of his side's goals himself. 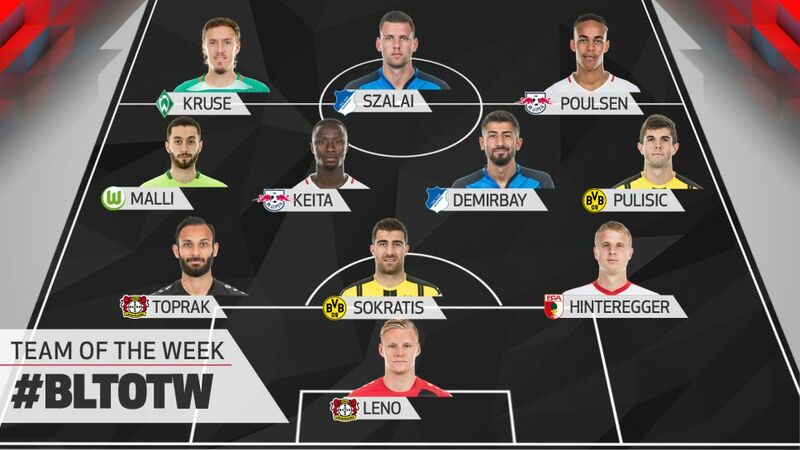 A superb assist in the third minute against Eintracht Frankfurt has earned the USMNT international a place in this week's Team of the Week. Darting into the box to collect a looped pass, Pulisic evaded Eagles' keeper Lukas Hradecky to find Marco Reus running in to skillfully slot the ball in. Max Kruse was at the heart of most of Bremen's attacks in the northern derby against Hamburg, firing off the equal highest number of shots (three), most crosses (three) and most passes (37) of any Werder player to spearhead the 2-1 comeback victory. The attacker is now only one goal away from reaching double figures in the Bundesliga for the fourth time. Scoring his third brace of 2017, Adam Szalai put Hoffenheim two goals ahead within 25 minutes against Gladbach, setting the tone for a gripping afternoon of football. Returning to his best following a six-week absence due to injury, the Dane not only broke the deadlock against Freiburg ten minutes from half-time, but also laid on Leipzig's second for team-mate Timo Werner. Poulsen now has three Bundesliga goals and three assists to his name this season.